After months of consultation in 2017, Grampian Model Railroaders Inc were advised that VicTrack had included the upgrade of the Stawell Goods Shed in its 2017/18 Community Use Program. This has enabled the renovation of the Goods Shed to its original state to go ahead, fully funded by the Victorian Government in its aim to maintain the states railway heritage for future generations. GMR Inc had already spent thousands of dollars on permits and draft plans etc, so this head start has helped the program progress faster despite having to re-start some of the permits and design work. 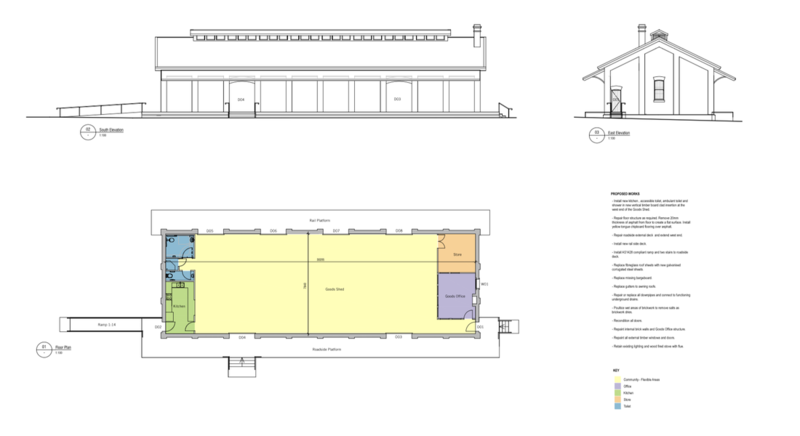 The renovations follow similar lines to our original proposal, however modifications such as a new platform on the station side and and other connecting platforms, have been incorporated in to the new plans. An improved kitchen layout and adjustment to toilets etc has seen our first plan tidied up and improved on by the VicTrack architects. Construction of new platforms and interior and exterior renovation works are expected to be completed in 2018. As part of the new leasing arrangement GMR Inc. have also leased the vacant land from the Goods Shed up to the boom gates giving us road access to the shed but also giving us the opportunity to use the land for parking on open days or possible market days as fundraising events.